We’ve all been there. You stayed home from work because you’re sick and couldn’t bear to get out of bed. The last thing you want to do is get up and go to the doctor’s office. Wouldn’t it be great if you didn’t have to leave your house to see your doctor? Video visits with your doctor have been long-awaited and are far too infrequently available. This is rapidly changing as millions of Americans gain healthcare insurance under the Affordable Care Act. With the influx of newly insured Americans, many are worried about the capacity strain this will put on the US healthcare system. This comes at a critical time, as approximately 17% of visits to the ER could be treated elsewhere, which puts a 4.4 billion dollar financial burden on our healthcare system every year.1 Virtual doctor visits could potentially reduce these costs by treating minor conditions such as colds, earaches or sinus infections virtually. This will keep patients with less severe conditions out of the ER or clinic, allowing physicians to spend more time with patients who have more serious conditions. Virtual doctor visits are also more convenient, efficient and cost-effective for both the patient and healthcare organizations. The Veterans Health Administration (VHA) recently conducted a study to measure the cost savings after implementing a national home telehealth program to coordinate care for patients with chronic conditions. 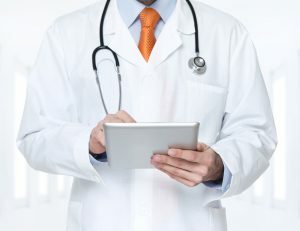 A cohort of about 17,000 patients showed a 25% reduction in numbers of bed days of care, 19% reduction in numbers of hospital admissions and an 86% satisfaction rating for the program.2 These results demonstrate the powerful impact telemedicine and televisits can have on cost, outcome and patient satisfaction. While virtual doctors visits will not replace in-person visits with your doctor, telemedicine is a good way to start an interaction with a doctor, monitor chronically ill patients or to do a follow-up exam without the hassle of taking a trip to see your doctor. Dr. Bruce MacLeod, president of the Pennsylvania Medical Society states, “I believe telemedicine is going to serve a bigger and bigger role in increasing the efficiency that we can monitor our patients. I think there’s a lot of potential there, but I don’t think it will ever replace a personal doctor visit.”3 Telemedicine is not necessarily meant to replace the in-person doctor visits, but rather enhance them in a way that allows people easier and better access to their doctors. The increased desire for video visits and telemedicine is enabled by changes in the technology used to deliver the video visits. Historically, telemedicine was delivered via capital-intensive, proprietary and dedicated equipment that made video visits and scalable telehealth very expensive and difficult to deliver. Newer software-only video chat and video conferencing solutions are making broad delivery of telemedicine and video visits possible. There are obvious restrictions to using generic video conferencing in healthcare settings, and it is imperative for healthcare organizations to use HIPAA-compliant, secure and encrypted technology to ensure privacy and protection of patient information. Revation Systems has enabled integrated healthcare systems, specialty practices, and primary care practices to deliver video visits to their patients. Contact us today for a free consultation and recommendations on how you can implement a cost-effective video visit offering for your practice.